Jeremiah David Martinez, 3, of Russellville,passed away Wednesday, March 14, 2018 at Arkansas Children's Hospital in Little Rock. The son of Juan and Maria Guadalupe Martinez, he was born May 23, 2014 in Russellville. He attended Connect Church. Jeremiah enjoyed playing drums, shopping, watching cartoons, especially, Daniel the Tiger and Elmo and going to church. 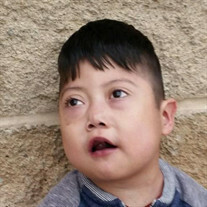 Jeremiah is survived by his parents, Juan and Maria Martinez; three brothers, Juan Daniel Martinez; Joann Abdai Martinez; Josiah Israel Martinez; three sisters, Reagan Martinez; Rebeca Verenice Martinez; Elyana Alejandra Martinez, all of Russellville; paternal grandparents, Alejandra Rubio and Juan Martinez of Mexico; maternal grandparents, Juana Victoria Medina and Francisco Javier Silva of Mexico and many aunts, uncles and cousins. Funeral Service will be held at 10:00AM, Saturday, March 17, 2018 at Humphrey Chapel. Cremation arrangements are under the direction of Humphrey Funeral Service. Visitation will be from 5:00 pm to 8:00 pm, on Friday, at the funeral home.